Hello everyone, I am participating in "skirting the issue" blog hop today! What is skirting the issue? It is a month long event where you are invited to sew along with Liz and Elizabeth of Simple Simon & Co and other participant bloggers to sew skirts to donate to local Foster Care centers. They have a goal of 1000 skirts to donate this year, so that the girls in the foster care have new skirt to wear on the first day of school. I am sharing the tutorial how to make a half circle skirt today with knit fabric. The half circle skirt is one of my most favorite styles, because it still has a look of full circle but less drama and actually stays with your body lines better (full circle skirts tend to blow up more with the wind!). It is a perfect mix of prettiness + functionality which is perfect for school! There are a couple things before we begin. I know, I have been there. You don't have a serger? Not to worry, you can still sew with knits if you know some tricks to work with them. I wrote a tutorial on how to sew a knit skirt with tricks you need to know a while ago, please head over to the post and see what kind of needle and working foot you need to use. It is a lot simpler than you think. Once you know how, you can customize a half circle skirt for anybody! There are many great tutorials in blog land, but some are harder to understand than others. Here is a very simple explanation of how I figured out the numbers to customize a half circle skirt for my daughter. 2. Take the measurement and do a little math problem. My daughter's waist was 23", so I did 23 ÷ 3.14 = 7.324.... round the number. I decided to go with 7 1/4". 3. Start drafting the pattern. I used my measurement, but when you are drafting a pattern you can use your number that you figured out for the inner circle and apply the number that you like for the length of the skirt. Remember, when you are figuring out the length, don't forget to include the number of the highs of the belt. Ok, the rest is easy-peasy! 58/59 Wide Mid weight knit fabric ------ 3/4 yard (I used the knit from Riley Blake Designs they are easy to work with and very nice quality). My daughter is 9 years old, if you are making this for older girls, you will need more yardage. 3/4" Wide Non Roll Elastic ---- waist length + 1"
1. Fold the fabric in half in the middle and lay down the pattern you created on it. Make sure that one side of the pattern seam matches perfectly with the folded seam. Pin and cut. 2. Cut 1 strip of fabric 2 1/2" Wide x the length of the waist + 3/4" seam allowance. 3. Fold the half circle fabric right side together. Match the seam perfectly and sew with 3/8" seam. Then treat the edge with your preferred stitches. Fold the seam towards one side and press with iron. 4. Bring both ends of the waist bands right sides together. Leaving a small opening for the elastic to go through later and sew. 5. Open the seam and press with iron. Then, fold the waist band in half horizontally. Match the top edge of the skirt and the edge of the folded waist band and pin. Make sure that the seam of the skirt and waist band match perfectly in the back and the opening for the elastic will show in inside of the the skirt. 6. Sew all around it and treat the edge as well. fold the seam toward the skirt and press with iron. 7. Top stitch to secure the seam and give a finished look. 8. 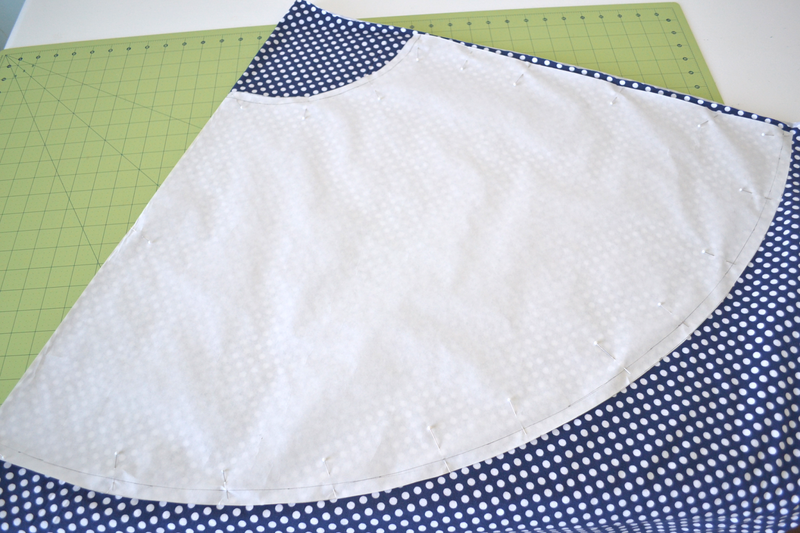 Fold the bottom seam by 1/2" and sew with double needle to finished it up. I knew the polka dot navy skirt would be so cute and versatile same with the gray polka dot as well. Because it was so easy and fairly inexpensive to make, I made two to add to her wardrobe. Time for a test run... I hope she likes it! Hi I'm just making this skirt.. it is a great tutorial thanks! However I can't see the step where you put the elastic in? The best tutorial I've found yet! Thank you!